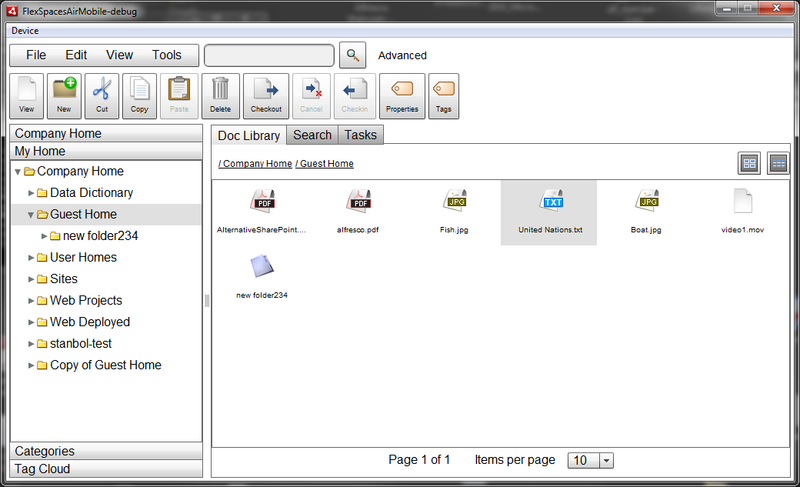 CMIS Spaces is a Flex based RIA Client for CMIS content mgt repositories with Desktop (AIR App, Flex In Browser) and Mobile (Android Mobile AIR App, iOS Mobile AIR App) versions. The source and first test version of CMIS Spaces Mobile is finally available on the CMIS Spaces Google Code site. Its geared more for Android tablets / iPads than smart phones. A first test build of CMIS Spaces Mobile for Android is available for download. The iOS version can be built from the common source using Flash Builder 4.6 / Flex 4.6 . 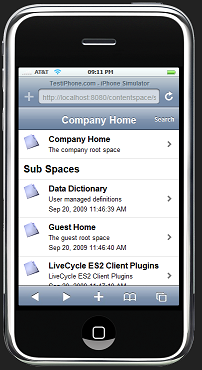 A newer version of FlexSpaces Mobile for Alfresco and newer source is also available on the FlexSpaces Google Code site. CMIS Spaces and FlexSpaces share a good bit code between them. FlexSpaces has support for more features (workflow, etc.) and uses custom web scripts instead of CMIS binding APIs. 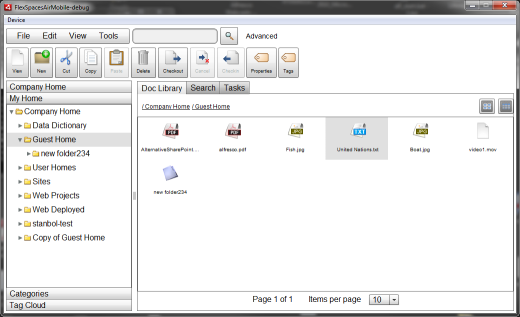 A third test build of FlexSpaces Mobile for Android is available for download. 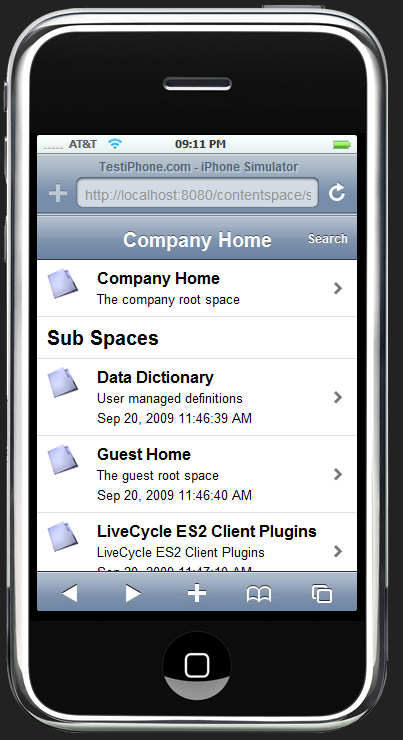 FlexSpaces Mobile for iOS can be built from the common FlexSpaces source. The first test version of FlexSpaces Mobile for Android (and Alfresco ECM) is now available for download on the FlexSpaces google code site. A more final version will be available on the Android Market for free. The first test version for iOS will use the “ad-hoc” testing Apple allows until an app is in the app store. For people interested in testing the iOS version (mainly for iPads, will fit on iPhone4 screens), send email to info at integratedsemantics.com. Test versions of CMIS Spaces Mobile for Android and iOS will be available soon too. Use settings / preferences on the initial login page to enter server domain/protocol/port. 3. Should work with LC Content Services ES (8.2.1). The deploy dir would be different. 4. I used it with an iPod Touch (not an iPhone). Also used with testiphone.com in a regular browser in the screenshot.